STAY AT HOME MOM: iCaughtSanta.com Review & Giveaway - 5 winners! iCaughtSanta.com Review & Giveaway - 5 winners! I received a free coupon code to create a photo on iCaughtSanta.com. This is $9.99 value. It was really easy to do too. I just took a few pictures of my Christmas tree. Then uploaded one on to the website. Then I picked a Santa I liked and then picked a border to go with it. I fooled around with it too. Like I didn't like the picture I uploaded at first so I started over with a different one. I played around with some of the different Santa poses, and could make him bigger or smaller, and even move my background around and zoom in or out on that too. There were different boarders to choose from too. But this picture is so cool. I'm going to save it until Christmas Day to show my kids then. Want to see now though? Buy it: Visit iCaughtSanta.com to buy your own picture. I also have a promo code for you. Use "SAHMSUE" at check out and receive 25% off. 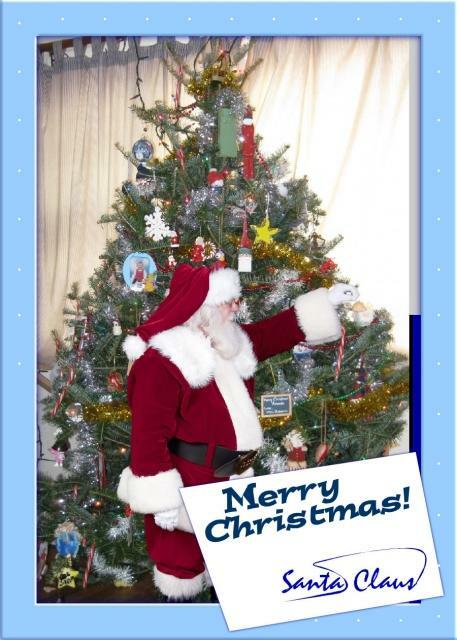 Win it: 5 lucky readers will receive a free coupon code to create their own iCaughtSanta.com picture. Mandatory entry: Visit the Santa pose page and tell me what your favorite pose is. Rules: Giveaway is open to US & Canadian Residents only. Giveaway ends December 18, 2010 11:59 PM. Please leave your email address in comments if not visible in your profile. Winner will have 48 hrs to confirm, or a new winner will be chosen. I like poses 6, 11 and 19! My kids would LOVE this! I love #20, the sleeping Santa. Would be perfect having him taking a little snooze on our couch. WW #133 "Gingerbread House & Train"
Ring In The New Year in Branson!